No rest for the wicked. Tun, a photographer learned this the hard way. One night after a drinking spree with college friends and his girlfriend Jane, the couple figure into a car accident, hitting a woman, but, instead of attending to her, they run and leave her behind. That accident starts a series of events ricocheting as different jinxed situations: the woman appearing in the photographs of Tun’s commissioned works, his friends committing suicide and the couple experiencing apparitions. The accident ploughs a deep trench filled with lies, deception and injustice. Shutter is a cult classic that began a trend in Thai horror cinema which caught international attention. The legend of Mae Nak of Phra Khanong has been told and retold over the years in comic books, TV shows and films. This movie gives a modern twist to the old tale about the famous ghost, continuing its search for husband Mak. Nak finds a living Mak in very different circumstances, engaged and eventually married to a different Nak, a living one, and Phra Khanong is no longer a canal but has become a railway station. Those who stand in the way of the ghost fulfilling its need to find its husband must still meet a gruesome end, thereby retaining the legend’s claim. And in the modern version, only the living Nak can stop the ghost. The grim atmosphere that hovers as an exorcist tries to fend off the spirits that erode the sanity of its victim can chill the spine like no other. ‘Troubled’ is an understatement when describing Ming’s life as a medium. Being a psychic to lost souls and talking to the dead is not an easy undertaking when one has to keep running away from one’s own phantasm. Her metier brings her to Buud, a pathologist who is deeply obsessed with his father’s death. He also happens to be Ming’s childhood friend but her traumas have blocked her memory about Buud. Buud believes Ming to be the answer to the mystery of the demise of his father. But Ming can only help him if she first confronts the demons of her own life. Oftentimes the living are more horrifying than any vengeful spirit. Phuchit is a salesman having a bad day. A co-worker has stolen his client, he’s lost his job and he’s been dumped by his girlfriend. Hs luck starts to take a turn for the better when he receives a phone call instructing him to do odd things. In return, money becomes deposited into his bank account. As the challenges get tougher and more bizarre, the money deposited becomes bigger and bigger. But what seems to be easy at first becomes harder and harder until the final challenge presents itself when he comes face to face with his Farang father who physically abused him as a child. Ton is a young lad uprooted from home to attend boarding school. All this was arranged by his philandering father after he was caught red-handed by Ton. Adjusting to his new life and environment is not easy for Ton and this is exacerbated by stories of ghosts by his peers. He becomes increasingly lonely until he meets Vichien. The boy becomes Ton’s best friend only for Ton to later realize that Vichien is actually the ghost that is haunting his dorm. But because of his friendship to Vichien, Ton is able to resolve issues regarding his family and those of the school community where he studies. There is no more ideal place to raise a family than in the suburbs. This is what Thee thought when he brought his family from Bangkok to the quiet and exclusive community of Ladda Land in Chiang Mai. Thus, the story sees Thee together with his wife, rebellious daughter and young son struggle to mingle with new people and to get into their daily routine in the new community. Then things start to happen – a Burmese housekeeper is found dead in one of the houses in the neighborhood, and then someone tries to rob Thee’s own home. The situation gets even worse after Thee loses his job and begins having thoughts about murdering his wife out of suspicion that she is having an affair. These thoughts become more and more compelling and confusing. And then his abusive neighbor murders his entire family, suggesting a dark energy within the gated community is being imbibed by residents, making them volatile and violent. The burden of guilt is like a festering wound eating away at the flesh. Nott is full of grief, suffering after the death of his girlfriend Pla. Nott cannot forgive himself for the motorcycle accident that killed her. He vows to do anything if given a chance to see Pla once more to ask for forgiveness. His friends can’t understand his obsession to talk to the dead but agree to help him in his last attempt. The challenge to open his eyes to the world of the dead leads them to an abandoned hospital. This location is not just a dwelling for ghosts but also cursed ground, and all those who enter its building do not return alive, except for one. Long weekends can turn out to be more deadly than they are fun. Thongsook is an outcast at school with only one friend, Nam, as company. He follows her around and this irritates her other friends. Only Nam knows Thongsook’s secret of being a medium for spirits and the dead, and his only protection is an amulet which was given to him when he was still a child. During one long weekend, Nam’s friends secretly plan a getaway to have fun in a deserted island, leaving Thongsook behind. Once on the island, they are surprised by his sudden appearance. So, being irritated by his presence, they pull a prank on him – one which has a deadly consequence. Life and death will always be in the hands of fate. Dao, a crime reporter, lands a big scoop as she witnesses the murder of a businessman. With shots fired at her by the assailant, Dao escapes but as she drives away, she gets a call that her father has just committed suicide and tried to burn his house down, starting what is to be a series of supernatural events leaving Dao mystified: the puzzling resurrection of her father and the cycle of life and death going askew. As she digs deeper into the wormhole of these inexplicable events, she finds that she is at the center of it all. Here is a little side trip to rest the weary mind from the unrelenting surge of psychological and supernatural thrillers. The “girls” from 2007’s Haunting Me (Hor Taew Tak) are back in this hilarious adventure which sees them tackle a new place of business with two ghosts in tow that scare the dorm residents. Taew, Cartoon, Motdum and Songkram return with their friendly ghost they call ‘Pancake’ to help them solve their ghoulishproblem. Their predicaments multiply as a new girl who is up to no good, Ponkoon, comes to town. Oh My Ghost! may not be the right film for the strict horror movie buffs but the horrifyingly colorful language of the girls will leave anyone else in stitches. Thai horror films have created a loyal following around the world. These films offer fresh takes and ideas in the horror genre, developed by giving old stories new twists. 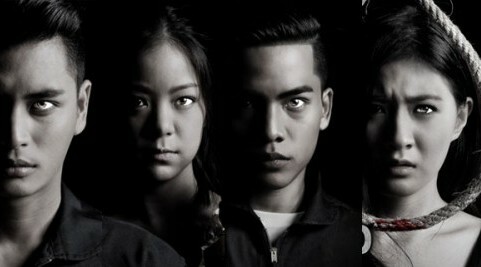 While the whole process of terrifying audiences is the very fuel of Thai horror films, the nation’s ghost films also carry tons of insightful ideas regarding the cultural differences of modern Thailand in the world of film. Find more horror films here. This entry was posted in ASIA, Features, Lists, SOUTHEAST ASIA and tagged 13 Beloved, 13: Game of Death, Banjong Pisanthanakun, Best Thai horror movies, Chookiat Sakveerakul, Dorm, Ghost of Mae Nak, Ladda Land, Long Weekend, Mark Duffield, Matthew Chookiat Sakveerakul, Park Poom Wongpoom, Shutter, Songyos Sugmakanan, Sophon Sakdaphisit, Taweewat Wantha, Thai films, Thai movies, Tharatap Thewsomboon, The Eyes Diary, The Spiritual World, Thongsook 13, Top 10. Bookmark the permalink.